Me Africa Advocacy Group (MAAG) in partnership with CalabarReporters, Owojela’s Blog, CrossRiver Daily’s, Negroidhaven, WeTrend Media, The Daily News and Voplink Media, is pleased to announce the launch of its conversational series #Engageyourrep – UNVEILING THE MANIFESTO, organized as part of its activities to promote participatory democracy in raising credible and accountable leaders. 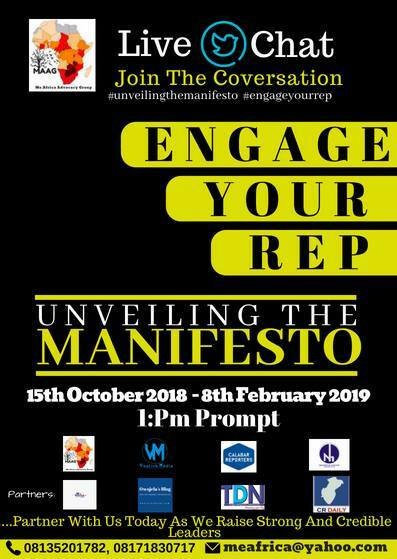 Me Africa Advocacy Group (MAAG) conversational series #Engageyourrep – UNVEILING THE MANIFESTO, seeks to create an interactive platform between the citizens and their representatives and also to create greater awareness and a clear ideological direction of the citizen’s representatives. It gives the citizens a platform to put forth preferences of their representatives who want to take over power, which will help raise a representative based on the citizen choices and preferences. This unique citizen-centric initiative would bring accountability and credibility to the governance system and in a way would lead to the creation of a citizen chosen agenda for the nation. The #Engageyourrep – UNVEILING THE MANIFESTO will host Twitter Chats on high impact areas like : unveiling of manifestos by representatives, the roots and ideology of the representatives, their inspirations, what tools will be used to solve the current problems faced in the State, LGA, and country etc. The Twitter Chats will be hosted using hashtags #, #Engageyourrep, #Unveilingthemanifesto. Me Africa Advocacy Group (MAAG) is a non-governmental organization that promotes human rights, active civic and political participation. Me Africa Advocacy Group (MAAG) also focuses on capacity development and youth civil society organization, promoting participatory democracy. Since its inception, the organization has carved a niche for itself, with its operational base in Cross River State, Nigeria.